Welcome to the website of the hit play 'The Rare Oul' Times'. The play is performed by The Nomadic Theatre Company, winners of the 'Good Companions Touring Award' at the National Fit-Up Awards in Dublin. 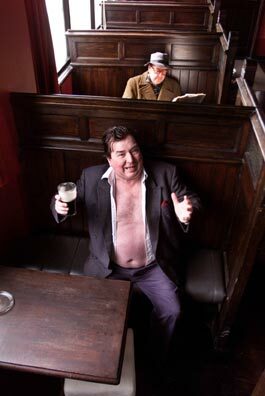 The action takes place in John Ryan's famous Bailey Pub in Duke Street, Dublin, where the audience are on-lookers as two of Irelands most outrageous and notorious drinkers and literary figures, Brendan Behan and Patrick Kavanagh, discuss their successes, failures and love lives to date in 1950's Dublin. Nostalgia, humour and song flow in equal proportions to thepints of 'black stuff', as the cast produce a memorable nights theatre that will send the audience home with a tear in their eye and a smile on their lips. Click on the title to listen through your internet browser. Alternatively, to save the file to your computer Right-Click on the title and opt to 'Save Target As...' [Apple Macintosh users click and hold].